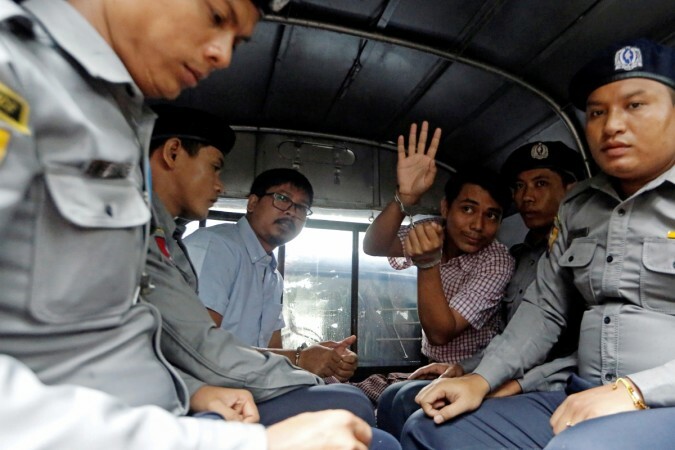 Reuters has won two Pulitzers, two of this year's honorees have been jailed for 490 days in Myanmar for their role in uncovering the killings. One photo by Kim Kyung-Hoon showed migrants fleeing tear gas launched by U.S. authorities into Mexico at the San Diego-Tijuana border. In the image, a mother grabs her twin daughters by the arm, one in diapers and wearing rubber sandals, the other barefoot, as a teargas canister emits its fumes. reporting of Trump's finances and tax avoidance and another for editorial writing by Brent StaplePost's Lorenzo Tugnoli won the feature photography prize for images of the famine in Yemen and the newspaper's Carlos Lozada also won for criticism.